Paying homage to one of the state of Oregon's most iconic mountain passes, the McKenzie Half Short from ProCorsa is designed with top-level materials so you can climb, descend, and power through in complete comfort. Conceived in Portland, Oregon, the McKenzie Half Short features 15 panels of premium-quality Italian fabric sourced from M.I.T.I. 's industry-leading bluesign® certified factory. Flat-lock stitching lies chafe-free against the skin, and a seamless inner leg prevents bunching or irritation. Generously wide compression bands provide even pressure distribution at the cuffs, and up top, the waistband has a similar construction to secure the short without feeling restrictive. Inside you'll find a premium multi-density seamless PERFect chamois with a seamless top and resilient padding that maintains shape and comfort mile after mile and ride after ride. The understated look of the short is exemplified by one small ProCorsa logo on the left thigh that lets the quality and craftsmanship of this garment speak for itself. Available in multiple colorways. Made in Canada from premium Italian fabrics. For the price these shorts punch way above their weight class. I would have no issues recommending them over plenty of similarly priced or more expensive European brands. Inseam length. I'm 5'-6' with normal proportions and the leg length is perfect for me. The compression bands end just where my quad muscles start tapering down at my knee. European sizing. Small is small. Again, I'm 5'-6 and some other brands' smalls are not snug enough for me or the legs are too long and I end up with a loose hem because they are right above my knee which is smaller around than my quad. I own the bib version of these shorts and all the same positives apply. Very happy with these shorts. Club rides. These need to be purchased in the next largest size as they do run SMALL and yes a draw string is needed as the weight band rolls. these are the reasons I only gave them four stars. you can't beat the price great value for your money! Road cycling, club rides. But order the next larger size as they run small and a draw string would be better as the waist ban rolls down. 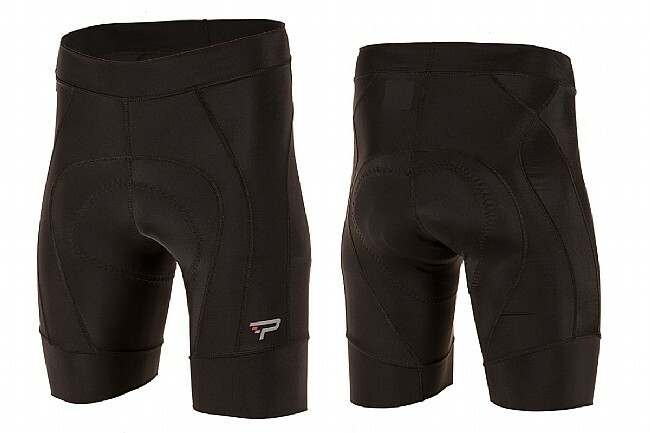 Well constructed and comfortable for up to 50 miles, but there is an unfortunate seam on the inner thigh that gets irritating if you are in these shorts for more than 3-4 hours. I usually ride in bibshorts, but sometimes on really hot days it's nice to skip the straps. Most half-shorts I've tried are a significant compromise - a lot of manufacturers don't seem to use the same quality fabrics, construction and chamois as their better bibshorts. Not the case with these ProCorsa shorts. I purchased a pair of the bibshorts when they first came out and they quickly became my favorites, so I decided to give the half shorts a try. These half shorts provide the same excellent compression and fabric feel as the bibs. The chamois is exactly the same as well. ProCorsa utilizes a wide rolled fabric waist, similar to what they use in the leg cuffs. This works very well for me. The shorts stay in position well without feeling like they are cutting into my waist. Now I have a hard choice - the half shorts and bib-shorts are both great values and really comfortable. Not worth buying at full price. The shorts were just a little small for me even though I bought the right size accourding to the size chart. The leg length is a little short. The length was not a problem until I tried to use them with my leg warmers. I had a gap between the shorts and the leg warmers. I pulled up the leg warmers which now became just knee warmers. The shorts really need to have leg grippers and the waist rolls down on you. I like the chamois and the fabric is nice. With leg grippers and a better waist band these would be awsome shorts. These shorts are a good value, good chamois and well made. The leg length, regardless of size is a full 2 inches shorter than other shorts. If you are like me and wear various kits and shorts, you will end up with a 2 inch band of untanned skin that will show when you wear these shorts. The other important thing is that your lower quads do not get the same degree of compression from these shorts as they don't extend far enough down the quad. Thank you to the guy in the shop who vouched for these shorts. First ride out was 3.5 hours and they worked like a champ. The chamois is better than the top of the line Pearl Izumi and Castelli I own. The waistband and leg cuffs are wide and comfortable. The waistband as wide as it is did roll down but did negatively impact the feel. Compare that to the PI Elite with a waistband that is narrow and super tight and I will take the roll down any day. Honestly, I doubt I will ever buy a different brand. Carried three pair of biking shorts during my 3000 mile trek across the US. Not a single saddle sore. Highly recommend these shorts. Very comfortable and quality material. These McKenzie shorts was a first time experience for me with this label. I was impressed by the fit and finish and materials of the shorts. The ride performance and comfort was top notch. This will not be my last purchase of McKenzie gear. These are my go to shorts if they aren't in the wash. Small padding that still keeps me comfortable on long rides, road or mountain. Good shorts for the Money. I liked the ProCorsa McKenzie shorts I recently purchased. They are comfortable and not to thick or hot. My only complaint, which I had noted before the purchase4 from the posted reviews, is that the waist band folds over rather easily. Part of the problem is my waist, the other is the design and lighter material used in this part of the shorts.